Going, going, gone the way of the dodo and the Daihatsu? Our friends at Hagerty Insurance have an ongoing web series called “Threatened, Endangered, Extinct” wherein certain vehicles, once quite commonplace, are singled out for their rarity or the non-existence of examples found other than on scrap heaps. It’s right up our alley here at FeralCars.com. We’re in the business of celebrating the uniquely ordinary — an oxymoron, perhaps, on par with “irregular pattern” and “mournful optimist,” so this is of consummate interest. We offer several candidates for one or the other of those categories. When was the last time you saw a ’77 Chrysler LeBaron coupe? 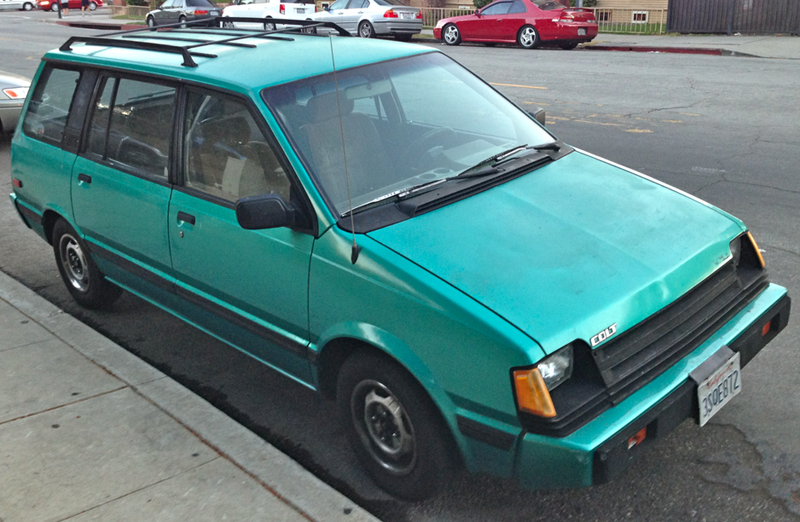 What about an ’87 Dodge Colt Vista? A Mitsubishi-built cross between a mini van and a station wagon. Perhaps utilitarian but definitely proportionally challenged and rarely, if ever, seen these days. Check out Hagerty’s latest (video) episode which covers the mid-70s Mercury Grand Marquis (Threatened), Isuzu Impulse (Endangered) and Fiat Strada (Extinct). What are your candidates for future consideration? Here’s a list of previous T,E,E nominees: 1984 Plymouth Voyager/Dodge Caravan, 1978 – 80 Oldmobile Starfire Firenza, 1986 – 87 Renault GTA (heck, just about all Renaults belong on the list), 1974 Olds Toronado, 1979 – 80 Plymouth Fire Arrow, 1975 – 1981 VW Scirocco, 1971 – 74 Mazda RX-2, 1981 – 85 Chevy Citation X-11, 1963 – 66 Studebaker Wagonaire, 1979 – 81 Toyota Supra, 1974 – 81 VW Dasher, 1985 – 85 Chrysler Laser XE, 1983 – 86 Chrysler Executive (K car-based!) Executive Limo, 1971 Plymouth Cricket, 1988 – 89 Toyota Celica All-Trac Turbo, 1980 Dodge St. Regis, 1984-85 Ford EXP Turbo, 1985 – 87 Renault Alliance Convertible, 1987 – 91 Sterling 825/827 — extra credit if you saw one of these in ’92! This entry was posted in Chrysler, Dodge, Ford, Mazda, Mitsubishi, Oldsmobile, Plymouth, Rattles + Squeaks, Renault, Sterling, Studebaker, Toyota, Volkswagen on 10/24/2013 by feralcars.